As the race for semi-final spots heat up in Zone ‘B’ in Barbados, the host team Barbados Pride are unbeaten with 14 from their three games, while CCC Marooners are in the second position with nine points from three games, while Guyana Jaguars are also on nine points but they are the only side to have played four matches. Jamaica Scorpions are in the penultimate spot in Zone ‘B’ with 4 points from three game, while ICC Americas, with three consecutive losses so far, are yet to register a point. While the tournament continues today with ICC Americas playing the Scorpions at the 3Ws Oval and Pride facing the Marooners at Kensington, the Jaguars are the only team to complete the first half of the five team Barbados zone. The top two teams from each zone qualify for the ‘Final Four’ from February 15-18 in Antigua. The Jaguars next match will be on Friday in their fourth day/night fixture at Kensington where they play their return game against the Marooners. This could be a crucial game for the Jaguars and depending on the outcome of today’s clashes in which Pride and Scorpions are favored to win. And it could be a race for the second spot between the Jaguars and the Scorpions. However, cricket is a game of glorious uncertainties as was shown when the Marooners upset the Scorpions in the first round. The Jaguars need to win at least three of their remaining four matches for them to book a trip to Antigua. from 09:00hrs on Sunday at the 3Ws Oval at Cave Hill since if the Marooners stage another upset in their game with Jaguars on Friday the South American Franchise will have to defeat Pride, a team packed with 12 West Indies players and the only side not to lose a match so far in a must win game. Led by two centuries and 271 runs from Kieron Powell, the Leewards Hurricanes lead Zone ‘A’ in Antigua with 14 points from three matches. The left-handed Powell has the most centuries so far and with five more games, is on track to break Ramnaresh Sarwan record three tons in the 2005 tournament when Guyana won the last of their nine titles. Pride’s Kraigg Braithwaite in second in the aggregate with 150 runs including a century from three innings, while Jaguars’ Skipper Leon Johnson, back in his favored middle order position after being forced to open for the West Indies, is third among the overall run scores with two fifties 135 runs from four innings. Windward Volcanoes’ Sunil Ambris (130 runs) from three innings including two half centuries, is fourth, while 42-year-old Jaguars left-hander Shiv Chanderpaul, who missed the opening game against the Pride due to ‘stiff neck’ and did not bat when Jaguars beat the Marooners, sits in fifth position with 123 runs from two innings including a century against the Scorpions. Chanderpaul, who played the first of his 95 Regional 50-overs games for Guyana in 1992, has two tons at this level and needs another century to join Brain Lara (4), Chris Gayle, Sarwan, Floyd Reifer and Keith Arthurton (3 each) as batsmen with more than two Regional 50-overs hundreds. The walking run machine enjoys an amazing average of 123 in this tournament and need just 10 runs to surpass Floyd Reifer to become the leading run scorer since 1976 when the inaugural Regional 50-over cricket tournament was played. 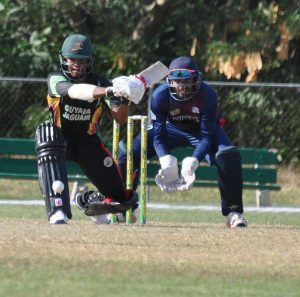 Raymon Reifer (114) is the only other Jaguars’ batsman with 100 runs, while Assad Fudadin (83), Rajendra Chandrika (55) are other Jaguars batsmen with 50 runs in what has been a generally disappointing overall batting performance. Pride’s off-spinner Ashley Nurse with 10 wickets in the tournament’s leading wicket taker while West Indies U-19 and Hurricanes’ pacer Alzarri Joseph and Jamaican speedster Jerome Tailor have 10 each. Jaguars’ left-arm spinner Veerasammy Permaul is joint third highest wicket taker along with Pride’s Sulieman Benn, West Indies U-19 Vice-Captain Guyanese Kemo Paul and Hurricanes’ Gavin Tonge, all with eight each, while Jaguars’ Ronsford Beaton, who captured a career best 4-28 in his last match has seven wickets, the same as T&T’s Ravi Rampaul. Devendra Bishoo has been inconsistent in this tournament and is the next best Guyanese wicket taker with six. Raymon Reifer (4) and Steven Jacobs (3) are next in line. Jacobs is the only bowler with an economy rate of under three runs per over in the tournament.